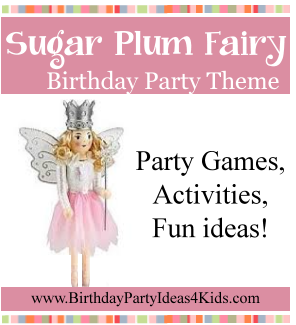 Fun ideas for party games, activities, party food, decorations, and more all with a Sugar Plum Fairy theme! After a magical journey through the snow forest Clara and the Nutcracker arrive at the Land of Sweets. They are greeted by the Sugar Plum Fairy. After they tell the Sugar Plum Fairy about their adventure, the Sugar Plum Fairy is impressed with Clara’s bravery and the Nutcracker’s heroism. In their honor the Sugar Plum Fairy gives them a lavish festival in the Candy Castle. To play this relay race game guests are divided into two teams. Each team is given two sheets of colored paper (heavy cardstock is best). Across the room set up a chair or a big flower that shows the kids where they have to run around before they go back to their team. The fairies can only use the 2 sheets of colored paper to move across the room. They will step of one, put the other in front of them, step onto it, pick up the one they just stepped off of and place it in front of the one they are standing on. They continue like this until they have gone around the flower and back to their team where the next person in line takes a turn. Party guests play freeze dancing on a floor filled with purple and white balloons. Gather the party guests in the balloons and tell them to dance while the music is playing, but when the music stops they must freeze in the position they were in until the music starts playing again ... then they can unfreeze and dance. Played similar to musical chairs. The only difference is that the players must tippy toe around the circle to the music. For a fun variation where no one is “out” …. remove a chair each round, but let the girls stay in the circle. They must find someone to sit with. This is a funny game especially near the end when everyone is trying to fit on one chair. For this relay race game you will need lots of tutu’s, 2 tiaras, ballet shoes, lipstick and other fun or crazy items that ballerinas would wear. Divide the guests into 2 teams. Each team lines up one behind the other and waits for their turn to do the relay. On the other side of the room set up a basket filled with the tutu’s and other items - one basket for each team. From each team girls race one at a time to the basket, put on the items, run back to the starting line, then run back to the basket and take the items off … then run back to the starting line and tag the next team member to go. All items must be in the basket before another girl can start. This game is even more fun if you have several (4 or more) tutu’s that the teams have to put on during the relay race. Sugar Plum Fairy May I? Played like Mother May I … except all of the steps are ballet steps. Choose one girl to be the “Sugar Plum Fairy” (mother) and have her stand at one end of the game playing area. Have the other girls stand on the opposite side facing her. One at a time the “Sugar Plum Fairy” calls the girls by name and says .. “Suzy, take one twirly step forward”. Suzy has to reply “Sugar Plum Fairy May I?”. And the “Sugar Plum Fairy” answers “Yes you may”. Suzy then takes one step toward the SPF in a twirling fashion. For every girl the number of steps and type of steps should be different. Some examples are: baby steps, leaps, twirls, steps in position 1 thru 5, etc. Party guests try to draw different Nutcracker themed objects while they are blindfolded. Give each player a piece of paper and a pen, pencil or crayon. Have them put on their blindfold and ask them to draw a nutcracker. Then tell them to take off the blindfolds and see what crazy pictures they come up with! Play several times. Great for an Icebreaker game at the beginning of the party when kids are arriving. *If you don’t want to use blindfolds the kids can put the paper on top of their heads and draw that way. Before the party make large gingerbread men cookies. During the party set our frosting and lots of small candies that the guests can use to decorate their gingerbread man. Wrap up and let them take home as a party favor. Sugar Plum Fairy Tutus - let guests make their own Sugar Plum fairy skirt. Cut long pieces of ribbon that are big enough to go around the child's waist with room left over to tie a bow. This is the base of the tutu. For the body of the tutu cut long strips of tulle in green, pink, purple and yellow about 2" x 3 feet. Lay the ribbon on a flat table and show guests how to fold the tulle strip in half, place the folded loop under the ribbon and then take the two ends of the tulle and put them through the loop. Pull the ends so that the loop closes over the ribbon attaching itself into a loose knot. Continue along the ribbon until it is full. Tie skirts around the waists of the fairies. Pieces of ribbon can also be cut into strips and added to skirt with the tulle. For younger children make the skirts ahead of time and let them add the ribbon. See our Tutu party craft page for pictures and directions. Set up a cupcake or cookie decorating station and let the guests decorate with fairy dust (sprinkles, colored sugar, and/or small candies). Decorate the house in pink, purple and white with touches of light blue. Two shades of purple helium balloons - blue curling ribbon. At each place setting set a tiara for the guests to wear while eating cake and ice cream. Tie pink and white balloons to the backs of each chair around the table. A fun idea is to blow up lots of purple, white and/or silver balloons (lots and lots!!) and scatter them all over the floor. Let the party guests dance through and around them. Extra fun with our Freeze Dance game!